The Dell M110 portable LED projector has a unique story to tell: it gives you 1280x800 resolution and computer-free presentations in a two-pound package for less than $500. And beyond that, the LED light source ensures that you'll never be plagued with expensive replacement bulb purchases over the projector's life. The M110 displays about 250 lumens of brightness, provides a multitude of input options and can light up a reasonable screen size in a fully lit room. 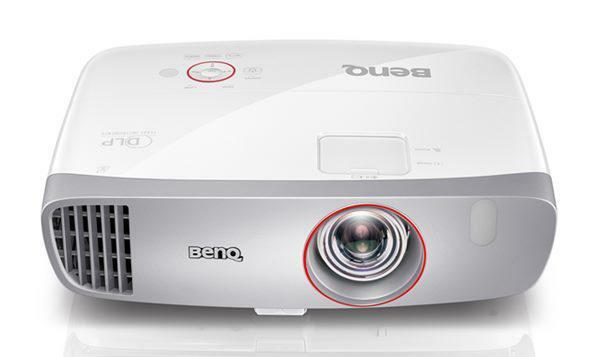 In the right hands, and under the right conditions, this projector is a downright wicked deal. We tested the projector with a variety of screen sizes, from a 30-40" diagonal secondary computer display in a fully lit room to a large 90" diagonal image in a dark dedicated theater room. The 250 lumen output of the projector allowed for a dynamic image in both extremes. The light output of the projector comes at the expense of color accuracy, but Dell has successfully balanced the trade-offs by providing a bright image with reasonable colors. Using the projector as a secondary display at a desk, we were able to achieve a 17" image width with about a 2 foot throw distance given its 1.5:1 throw ratio. The M110 was more than bright enough even in Eco mode (under direct, fluorescent lighting) when using a piece of 11x17 paper as an improvised screen surface. In a fully lit room, the maximum acceptable image size was three feet wide or 42" diagonal. In a conference room with a 60" diagonal screen, it was necessary to draw the shades at the front end of the room and turn off the first bank of lights. Thanks for your Review, What about the 10,000:1 contrast, is really true? I wonder if the wireless dongle on with lag when you're watching a movie, listening to music. In the case that you mentioned in the review was about the input lag of commands from the computer and not on automatic lag in presentations such as movies, videos and music. I wish that if possible, I clarify this point. Purchased this little projector and happy with my the output this provides. It's a steal if portability is the main need. Smaller than I expected it to be aswell and it sits nicely on my tower PC to throw against the far wall when needed. One con if anything that was mentioned in the review was the pinpoint focus. If you focus from a distance (say 6 ft) in the centre, the edges are softer. This started to hurt my eyes after a while, as I was looking about a large projected screen of my desktop and see soften text. It requires me to focus my eyes a little too often. I have a projector model M110. I would like to turn the projector model M110 and adapt it on the ceiling of the room. Is it possible to do? How do I adjust the screen image? have you tried it with a samsung galaxy note 10.1? if yes, what cable did you use? Wow!Dell 110M is indeed a nice projector even for home cinema.I use to watch movies on a big screen of 120 inches diagonal.sometimes i run the projector for more than six hrs continuosly and it works smart.what i like most is its picture quality on a 16:9 screen. This is a real portable power packed projector. I purchased this projector and was quite impressed with the projection and brightness. However, there are couple of things I noticed - Focus is not uniformly pinpoint. This means that when I focused left top, text on bottom right got blurred. This may not be visible in movies, however,this type of focus is not good for reading purpose since it started hurting my eyes after few minutes. Other thing I noticed was that when I play movie which has little dark background, I see clouding/little graphic boxes moving with the image in the Projected image. Having said this, this may not be completely due to projector since i see these small graphics in my laptop as well. But Projection makes them large and visible. Sometimes it is not a very good experience to see them spoiling the image quality while watching movies. I have read some other reviews as well where focus was reported as issue. If Dell resolves these issues, I would Strongly recommend this Projector over any projector in this segment. Biggest positives of this projector - Full of features as compared to size, very portable - no other projector can beat this one, 300 Lumens may not sound much however in realty it is very bright for LED projectors. I returned this projector for the above two reasons. I chose other which has little less lumens than this, but is not having two issues i mentioned. Has anyone been able to connect this to a Wii? I tried pluggin in my Android Nexus phone to the Dell M110 with the HDMI cable, but the Dell does not recognize the phone. Is there a process or an app that I am missing? Planning to buy the DELL M110. Please suggest if it's a right choice. I would only see movies and only movies. I have a complete setup at home. Please suggest. Can this projector be ceiling mounted? dell m110 is great, but I was unable to connect my audio. sys.while watching with pendrive. without audio output the movie was 0 effective. please guide me how to connect my home theatre speakers. Hey Jeff, would love to see your review of Optoma's new ML550 relative to the Dell M110. On paper they look almost identical apart from Optoma's lower noise spec. I'm curious about software/interface differences. Adquirí un proyector dell modelo 110, pero al conectarlo al computador con el cable HDMI el audio es local y muy bajo, como hago para lograr un mejor sonido, o lograr una salida para conectar unos parlantes externos desde el proyector o desde el computador ??? Can some let me know whether this Dell M110 projector supports 3D Ready Movies? I have a distance of 20' from the screen. Which led projector is good for me?